I had the opportunity to meet Chef Jean-Marc Mathieu when I was having dinner at the restaurant in May 2009, and learned that he was born in Belgium and moved to Canada when he was a child. For the last five years, he has called the kitchen at Le Saint Gabriel home, where his culinary philosophy is to find the best products locally and in the Québec region, before branching out to other areas, and to keep the food as natural as possible without changing it too much. For a chef, having the freshest products is essential and he likes to visit the local farmers to buy the freshest ingredients, and since he lives in the country he has his own gardens and enjoys spending time outside working in them. 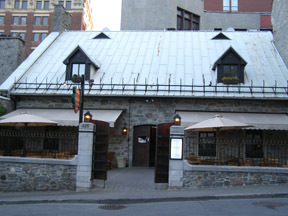 The Auberge Le Saint-Gabriel has a long history and began life as the home of French soldier, Étienne Truteau, and later became the first North American Inn in 1754 with the owner, Richard Dulong, receiving the first liquor license ever granted under British rule on March 4, 1769. 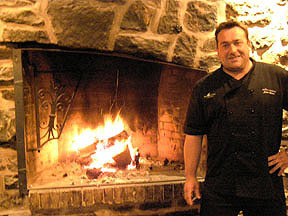 As such, there are numerous fireplaces located throughout the Auberge Le Saint-Gabriel, which is now simply a gorgeous restaurant, and Chef Jean-Marc's vision is to start cooking in the fireplaces during the colder months, along with his latest "toy," an enormous rotisserie in the kitchen. When not working at the restaurant, he likes to travel and eat at new restaurants trying all kinds of food. He shares a delicious taste of the Québec region with his recipe for Fève au lard du Saint-Gabriel (Saint-Gabriel Baked Beans). Method: Soak the white beans overnight for 24 hours. Drain the beans, and reserve the soaking water. Put all ingredients in layers in a pot in the following order: white beans, onions, bacon, brown sugar, dried mustard, salt and pepper. Repeat the order at least twice and finish with the molasses. Pour the reserved water over the layers and cover the pot with a lid. Bake in the oven at a low heat for 4 to 5 hours. Bon Appetit! 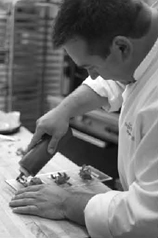 Read about Auberge Le Saint-Gabriel in the Restaurants section and also in Chefs' Recipes where Chef Jean-Marc Mathieu shares his recipe for Fève au lard du Saint-Gabriel in French. Read other articles on Montréal in the Destinations, Hotels and Resorts, Restaurants, and Chefs' Recipes sections in French.